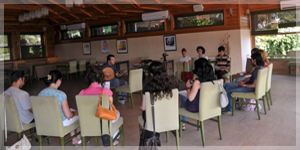 The music camps, which can also be named "Music Workshop", means the seminar performed out of the university, and applied works of the persons within the same profession together. 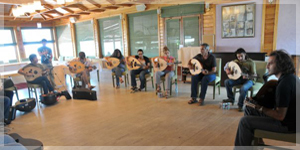 These camps are hold throughout the world and primarily based on Classical Turkish Music. The Classical Turkish Music Camps organized in foreign countries is much sought after and is realized with the participation of valuable Turkish music master, who are known worldwide, and interestingly, this camps could not be performed in our homeland. Basing on the interest shown to Turkish music and Turkish music instruments in the music camps organized in foreign countries, we took the first steps last year with the purpose of creating the music camp concept in our country and we realized it with success together with the participators coming from all over the world under the name of "I. Klasik Türk Muzik Kampi Istanbul 2007" (1st Classical Turkish Music Camp, Istanbul 2007). This year, we completed our "2nd Classical Turkish Music Camp, Edremit 2008" with the great increase in the number of participators and under the sponsorship of Ulus Muzik and Edremit Municipality; and besides, we presented our public Classical Turkish Music Concert that we specially coordinated after the camp and this different concept attracted much interest. Our masters constituting the main roof in our Classical Turkish Music Camps are worldwide known virtuosos such as Zither Kanun Göksel Baktagir, Lude Yurdal Tokcan, Violin Keman Baki Kemancı, Reed Flute Ömer, Clarinet Tanju Erol, Percussion Cevat Akbulut, Classical Turkish Music San Ahmet Erdoğdular, Drum Bora Uymaz, Baglama Ali Osman Erbaşı, Greece Mode and Theory Christos Tsiamolis. As in the previous year, the participants this year have been mostly from Turkey, Greece, Holland, Belgium, German, France, Kuwait, Dubai, Tunisia, Algeria and America. As Ulus Group, our mission is to be able to introduce the richness, colorfulness and variety of Turkish culture to the world culture and to enable the whole world to take advantage of this cultural accumulation. By means of the Classical Turkish Music Camps, we took this goal of us one step further. We are happy and proud of coordinating such an organization initiated with the purpose of introducing Turkey and Turkish culture to the foreign countries.